First look of Salman Khan from Kabir Khan's family entertainer Bajrangi Bhaijaan. Bajrangi Bhaijaan will be released this Eid and is the first film being produced by Salman himself under his banner Salman Khan Films along with Eros International. The rage for the teaser of 'Bajrangi Bhaijaan' was so much thatSalman Khan's fans were waiting for eagerly for it. And now that it is out, fans can't stop sharing it on their social media walls. The teaser, which was unveiled by Salman Khan himself on his Twitter account, last night at 8 pm has received retweets 6,620 and 9,478 favorites. Just not it, the video on YouTube is also gaining popularity and has got 565,341 views in just a night. Salman Khan is a Bajrangbali devotee and in the 1 minute 33 seconds video, you can see Salman Khan in almost every frame. Kareena Kapoor Khan looks beautiful as usual and Nawazuddin Siddiqui makes his presence felt effortlessly. 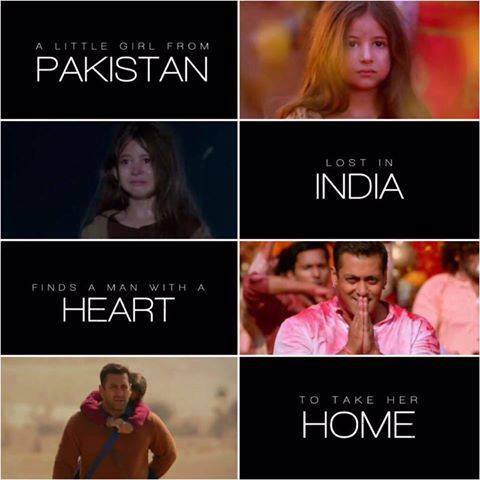 "The trailer of the Kabir Khan-directed film begins with a little girl from Pakistan, who gets left behind in India. Salman turns saviour for the girl and has taken it upon himself to get her back to her native country.In the action-packed musical teaser, which also features Kareena Kapoor Khan and Nawazuddin Siddiqui, Salman says he will rather die than lie. The first look of the film, launched on May 26, saw Salman in a brown outfit with a gada (mace)-shaped pendant hanging around his neck. 'Bajrangi Bhaijaan' will release this Eid.